Ukraine is facing many unanswered questions after President Viktor Yanukovych fled the capital Kiev and parliament voted to oust him. A power vacuum opened up on 22 February when police suddenly abandoned their posts around government buildings and Mr Yanukovych's palatial residence. Now a council made up of representatives from the main protest site in Kiev, the Maidan, has nominated an interim government, made up of a mix of activists and politicians. The stakes for Ukraine and its 45 million people are enormous, with the country's fate being played out amid a wider strategic battle between the West and Russia. The Ukrainian parliament is still functioning, and moved quickly to appoint a close ally of former prime minister Yulia Tymoshenko - Oleksandr Turchynov - as interim president. Separately, the Maidan council named Arseniy Yatsenyuk - a former speaker of parliament and foreign minister - as its choice for prime minister. Crowds in Independence Square were broadly supportive of the nominations, and MPs will now vote on the government on Thursday. Looking further ahead, MPs have agreed to bring elections forward to 25 May. Yulia Tymoshenko - Mr Yanukovych's arch-rival - could be a strong candidate again, although her spell in prison has taken its toll on her health. Ms Tymoshenko is a leader of the 2004 Orange Revolution which toppled Mr Yanukovych a decade ago. Is it all over now for Mr Yanukovych? Clearly he has lost his authority in Kiev and western Ukraine but he still has some support in his heartland, mainly Russian-speaking eastern Ukraine. Many of his allies have deserted him. But he insists that he is still president, and has denounced the protests as "vandalism" and a "coup" against him. His whereabouts are still unknown, though he is believed to be in the east, where local leaders say they will remain in charge of their territories, whatever Kiev decides to do. If caught, Mr Yanukovych, could face prosecution over the killing of protesters. What about the police and army? The police have now sworn allegiance to the opposition, after weeks of fighting running battles in and around the main protest camp at Independence Square - or Maidan. The army has pledged to remain neutral in the crisis. So a military crackdown looks unlikely. There will be much pressure now to bring police snipers to justice, after they were filmed shooting at protesters. The Berkut riot police is widely loathed for its role in protecting Mr Yanukovych and beating up protesters. Who are the faces to watch? Former heavyweight boxing champion Vitali Klitschko of the pro-EU Udar (Punch) movement is seen as a strong contender for the presidency. Unlike many Ukrainian politicians he is free from the taint of corruption and for years he has castigated Mr Yanukovych, accusing him of running the country like a personal fiefdom, appointing cronies to key jobs. Yulia Tymoshenko was jailed in 2011 for abuse of power. She said the charges were invented to keep her out of politics. She has many allies in parliament, in her Fatherland party, but her spell as prime minister after the Orange Revolution was controversial. Many opposition activists do not see her as a heroine and it is by no means clear what role, if any, she will have in Ukraine's future administration. There could be rivalry now between two top allies of Ms Tymoshenko - the new Prime Minister Arseniy Yatsenyuk and the acting President, Oleksandr Turchynov. Mr Yatsenyuk, a lawyer, held senior positions in the pre-Yanukovych government, and he has been Fatherland's chief negotiator in this crisis. He wants Ukraine to forge close ties with the EU. Mr Turchynov is another longstanding Tymoshenko ally, with previous experience in government. He also served as head of the state security service, the SBU. He is an economics professor and trained as a metallurgist in Dnipropetrovsk, a centre of heavy industry. Meanwhile, Ukraine's "chocolate king", business tycoon Petro Poroshenko, is also a powerful figure close to Ms Tymoshenko politically. He served previously as foreign minister and trade minister. He runs the Roshen confectionery empire, which was targeted by a Russian import ban last year. Forbes magazine estimates his wealth at $1bn. His business empire includes car and bus plants, a shipyard and the TV channel 5 Kanal. He wants Ukraine to integrate with the EU and modernise, and has opposed Mr Yanukovych for years. Oleh Tyahnybok of the far-right Svoboda has also played a prominent role in the protests. 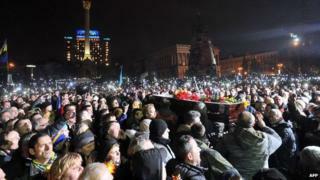 Svoboda activists portray themselves as patriots who want to eradicate corruption. Svoboda (Freedom) is the fourth-largest party in parliament and its support base is in western Ukraine, traditionally the heartland of nationalists. In the east and south of Ukraine the party is widely seen as extremist. Is there a risk of Ukraine fragmenting? There have been some ominous signs. In Kharkiv, in the mainly Russian-speaking east, regional leaders said they did not want the break-up of Ukraine, but they questioned the legitimacy of the parliament in Kiev. The east is where Mr Yanukovych has most support. The anti-Yanukovych opposition is strong in western Ukraine and has taken control of local politics in Lviv, Ternopil and other cities. It is not clear how Kiev will re-impose its authority in those areas either. Russia is clearly unhappy at the turn of events. Foreign Minister Sergei Lavrov condemned "illegal extremist groups" in Kiev who, he said, had seized power "with the connivance of opposition leaders". Moscow has also voiced concern about the dire state of the Ukrainian economy. Russia has suspended the next instalment of a $15bn loan for Ukraine because of the political uncertainty, and has put troops in western areas on alert. On Wednesday the US offered Ukraine loan guarantees of up to $1bn (£600m) in an attempt to shore up its struggling economy. The EU has said it too is ready to offer substantial financial aid to Ukraine as soon as it has a new democratic government. But so far the EU has offered nothing to match the Russian loan. A big symbolic step would be to sign the EU-Ukraine association agreement which Mr Yanukovych abruptly refused to sign back in November - the action which triggered the massive street protests.